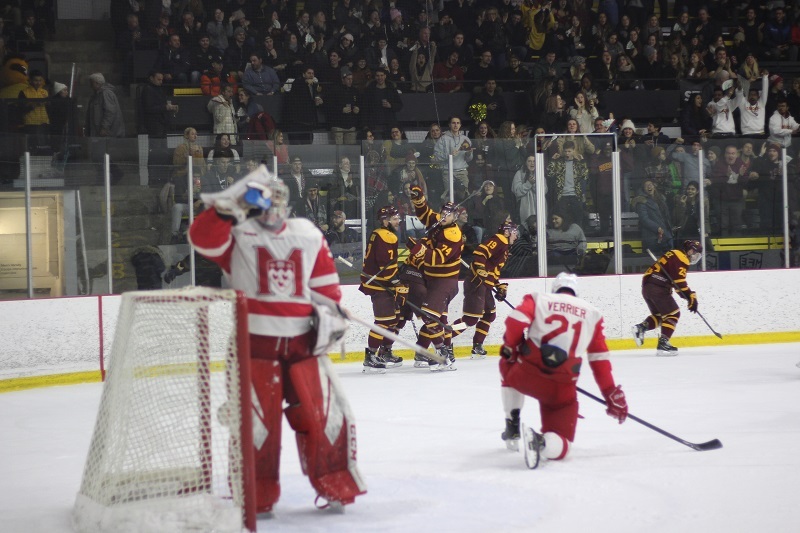 In front of a packed house at the Ed Meagher Arena, the Concordia Stingers men’s hockey team won the 32nd annual Corey Cup against the McGill Redmen. This victory makes it the Stingers’s second-straight Corey Cup win, having won 4-3 both this year and last. The officials were quick to break up Zachary Zorn’s fight with Nicolas Poulin. Photo by Hannah Ewen. This game had all the elements expected from a rivalry. The two teams combined for 18 penalty minutes, 14 coming in the second period. Midway through the second, McGill’s Nicolas Poulin went after Stingers forward Zachary Zorn after he delivered a huge hit. The players dropped their gloves for a fight, but were only given two minutes for roughing. Indiscipline also played a factor in this game. McGill’s opening goal late in the first period was scored on a power play, and gave them a 1-0 lead at the first intermission. After forward Charles-Éric Legaré tied the game early in the second, McGill retook the lead with another power-play goal after Zorn’s penalty. Charles-Éric Legaré scored at the beginning of the second and third periods. Photo by Hannah Ewen. Legaré scored his second of the game, and 11th of the season, early in the third period to give the Stingers a 3-2 lead. In eight regular-season games against McGill these past two years, Legaré has five goals and an assist, including a goal in last year’s Corey Cup. Élement said Legaré plays his best hockey against McGill because he enjoys the large crowds. Stingers Captain Philippe Hudon played in his fifth and final Corey Cup, and it’s the third time he’s won it. He said he’s proud he’s been able to win the trophy in front of the home crowd two years in a row. Midway through the third period, with the game tied 3-3, Hudon skated wide into McGill’s zone and dropped a pass for Hugo Roy. Roy blasted the puck past Louis-Philippe Guindon, igniting the crowd with the eventual game-winning goal. Hudon said he didn’t see the puck go in but heard the crowd’s roar, and celebrated like he scored a goal. With the game tied three times, Lalonde said it helped to have the crowd behind them the whole game. “It’s a rivalry, so we know we’re never going to get behind no matter what happens, especially with the crowd into it,” Lalonde said. With the win, the Stingers improve to 15-9-2 on the season and are in fifth place in the Ontario University Association (OUA) East with 32 points and two games left. McGill sits in fourth with 36 points, so the two teams could meet in the first round of the playoffs. McGill beat them in the OUA East final last year.